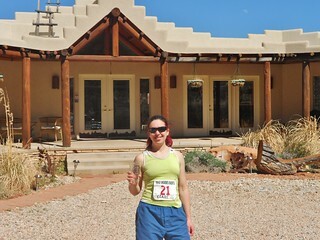 Crossing the Finish Line in 87 dF temps after 7 hours 13 minutes of running. 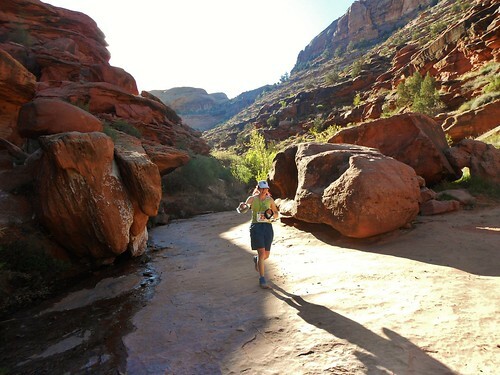 I was researching single track trail 50k races held in Utah during the month of March, and I found Behind The Rocks. 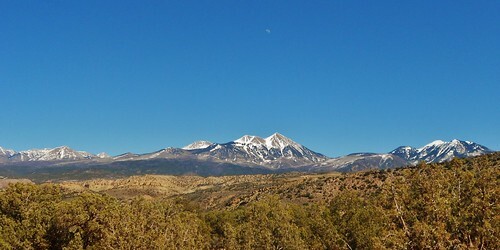 Just south of Moab, in the high desert and set against the backdrop of the La Sal Mountains, the BTR run is a challenging yet beautiful race. It is an out and back, with some variation on the way back to keep it interesting. Just prior to the turnaround, at the halfway point, there are a series of ledges involving some 3rd class scrambling and a bit of exposure. FUN! 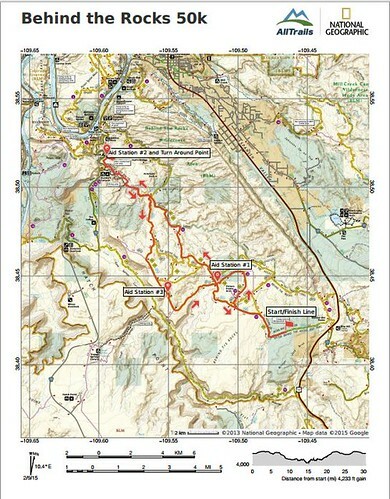 I contacted the race director to ask some questions; mainly to make sure the event was not on pavement and to find out the total amount of elevation gain. Justin responded to my questions promptly. He was really friendly and encouraging. 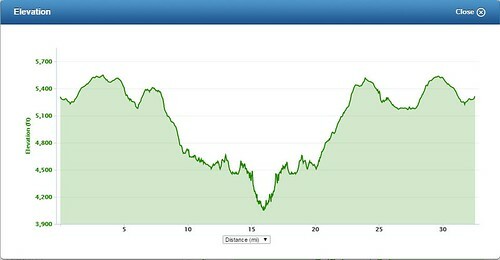 He mentioned the course was a bit longer than a 50k (turns out it’s 32.5 miles), that it was definitely not on pavement, and it was ~3,800 ft of gain (turns out it’s ~4,100 ft of gain). 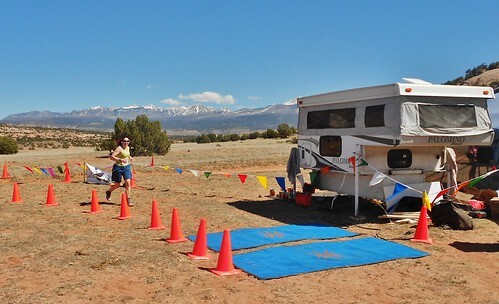 In my experience running 50k trail races, the Race Directors are often not hung up on the specific distance or gain parameters and their main focus is running a safe and smooth event. 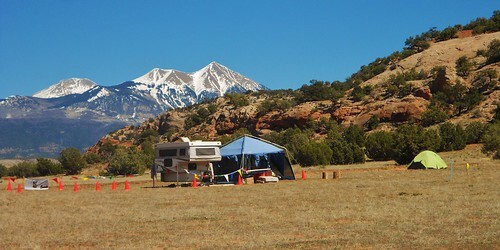 The Race Director’s Campsite, at the Finish Line! Imagining Success at the Finish Line! 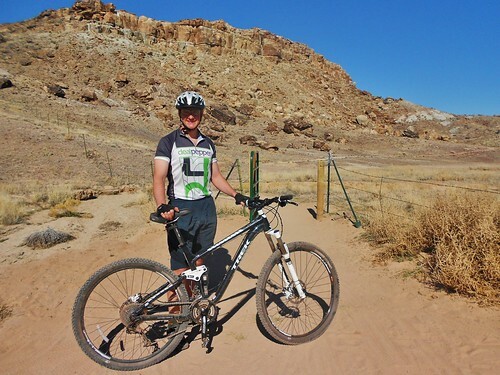 On Friday, I dropped Dennis off at the Klondike Trails, so he could do some mountain biking. While he was doing that, I got my stuff ready for race day. Then, I picked him up and we drove to the start of Behind the Rocks 50K, so we would know where to go for the 6am race start. Packet Pickup was really easy and I ran into Doug and his friend Craig. We arranged to meet for dinner (a second night at Pasta Jay’s). Then, it was time for bed! 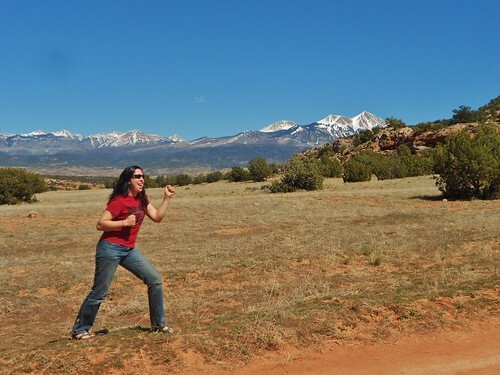 On Thursday, Dennis and I drove to Moab, Utah. I was excited to run the Behind The Rocks 50K Trail Ultramarathon and he was excited to sample the famed mountain bike trails. The drive went really smoothly and we arrived in Moab mid-afternoon. Laura and I on the top of Green Mountain. 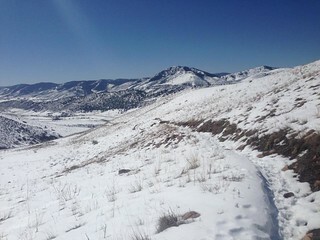 Looking back down Box O’ Rocks trail. 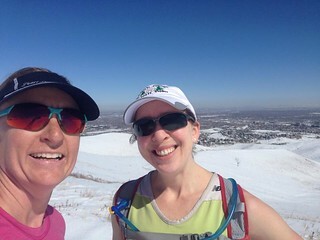 On Friday, I met up with Laura for my training run at Green Mountain. She ran with me for the first couple hours of my run, so it was great to have company. 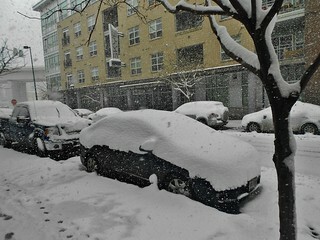 We met fairly late in the day, so the snow was already beginning to soften. By the end of our first loop (8 ish miles), it was turning to slush. During my second loop, the trail had devolved into full on slush with rivulets of mud sliding underneath the snow. I got very wet and muddy as the day continue to warm up. I was running a bit too fast down a steep grade and I fell and landed in the mud. Bits of ice cold mud and water splashed up over my head and dripped down my sunglasses. The entire right side of my body, coated in a thin layer of mud. Thankfully, with nothing other than an abrasion on my leg and palm, I continued back to the car. At the end of my second loop, I decided I had enough of the slush and opted to finish the last 3 miles by running on the paved bike path. Being on a firm surface allowed me to finish my 4.5 hour excursion with some fast miles and it felt good to open the throttle at the end. 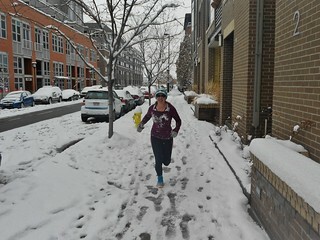 The only time running on pavement is acceptable is when it’s covered with snow! I love running in the snow. It cushions the blow to the joints, it doesn’t make you wet, and the blanket of snow makes the world quiet. This President’s Day, I had a 90 minute training run on the schedule. I had a lovely time on the Platte River trail and then ran down the Cherry Creek Bike Path. By the end of my run, it was snowing so hard, I could only see about 20 feet in front of me. Fun times!